This little blog has transformed over time from a food blog to my space to talk about the latest and greatest of Coeur de La Photography. I write about recent shoots, weddings, photo adventures (which are all wonderful) but lets not forget how my photography journey started … as a food photographer. Fast forward and I thought why not incorporate more food photography (drum roll pleassssseeee) and … recipes. 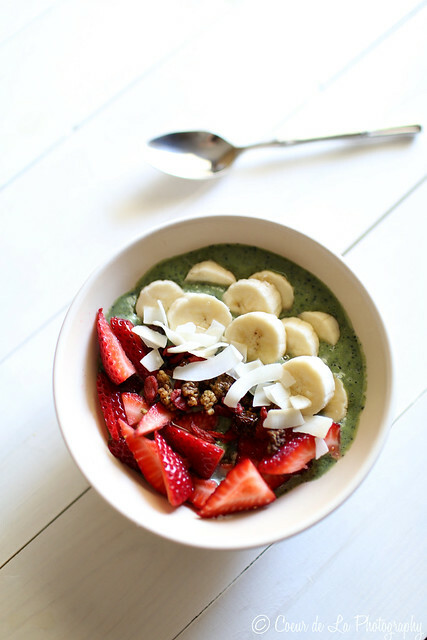 Without further ado from my kitchen to yours … a morning smoothie bowl that will have you dancing. 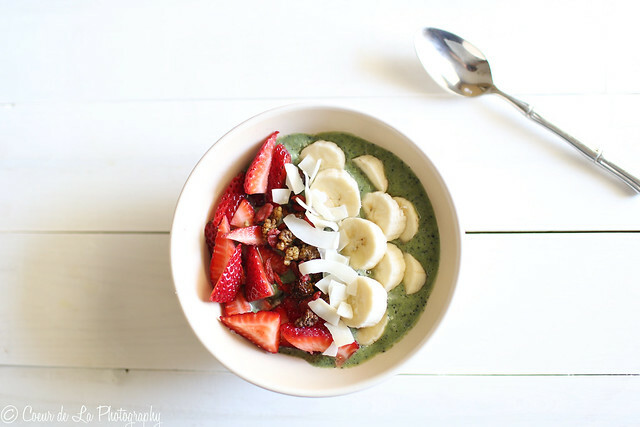 Smoothie bowls simply put are … rad (yes I still use rad to describe something really amazing). I love breakfast and have been trying to make breakfasts that have me leaving full, healthy, and all together good because with a busy on the go lifestyle I need meals that pack a punch. Tid bit: I absolutely love love love acai bowls and for me a smoothie bowl is a nice and easy alternative. My go to breakfast smoothie is packed full of goodness from avocado, spinach, blueberries, a banana, almond milk, chia seeds, and a little protein powder. This combination may seem a little crazy but it leaves me feeling full for hours on end. I had an epiphony after going to one of my favorite spots for an acai bowl a couple of weeks ago and I came home inspired to put together a version I can call my own using my smoothie recipe. The good stuff: I decided I would make my usual morning smoothie (described above and made with a little less almond milk) and put it in my favorite bowl. I sliced bananas, strawberries, and then sprinkled dried coconut and goji berries on top of my smoothie mixture. Then I drizzled a little local honey and the result: a Morning Coeur Bowl. No matter what I kind of mood I wake up in there is no possible way not be happy while eating a breakfast so colorful. I know this is going to be a tried and true staple … I mean we all need a little goodness in the morning … right?! I know I do … enjoy! Yes, why not food photography?! This looks so refreshing and yummy.